The Planet Mars - the famous "red planet"
The planet Mars is the fourth from the Sun, the second smallest of the four "terrestrial" planets. I think it's probably surprising to most people (including me) just how small Mars is. It's just over half the size of Earth and not that much bigger than Mercury. It is 4218 miles in diameter and orbits the Sun at a distance of roughly 143 million miles. It takes 687 Earth days to do this. One revolution of its axis (i.e., a Mars day) is about 24 hours and 40 minutes, almost identical to Earth. Another similarity to our home planet is the fact that the planet Mars has an axial tilt, giving it seasons. The red planet weighs in at around 708 million million million tons and its density is much less than Earth's. It's more like the Moon's, so, in the future, anyone walking about on the surface of Mars would do so as if in slow motion, like those newsreel shots of the Moon landing astronauts. The surface of the planet is covered with a fine dust of iron oxide. This is what gives it its red colour (more a dirty brown). This compound, in another form, is found on Earth, where it is known as "rust". Periodically, this dust is whipped up into a storm by fierce winds, sometimes covering the entire planet. These dust storms are the largest in the solar system. Here, the images have been given false colour, to bring out the differences. The blue areas have the low altitude and, with that colour, could easily be imagined as oceans. The reason for this strange topography is still under debate, although one theory is that the planet was once hit by a large celestial object, similar in size to our Moon. Those areas of low elevation typically consist of lava flows, but the rest of the planet features such things as volcanos, impact craters, canyons and caves. Most of the volcanos on the planet Mars are arranged along the line separating the low area from the high. There are two main regions - "Elysium" and, by far the most impressive, "Tharsis". This latter region contains what may be the tallest mountain in the solar system - Olympus Mons. This huge geological structure is an impressive 14 miles tall (Mount Everest is less than three miles) and I've said it may be the tallest because there has been a similar sized mountain discovered on the asteroid Vesta. Both are roughly the same height, so it's a bit of a toss-up which can claim the title. The planet Mars features craters similar to our Moon's. The difference here is that they have been eroded over the millennia, due to the presence of a thin atmosphere (see below). You may not be aware of this, but craters on celestial bodies have several different classifications and, apparently, Mars features the greatest diversity of these types on any body in the solar system. One notable feature is the Hellas Basin, which is 1120 miles in diameter. As their name suggests, they are geological features similar to the Earth's Grand Canyon, though these martian formations dwarf their earthly counterpart. This network of canyons extends for around 2,500 miles in the planet's equatorial area and, in places, can be 190 miles wide and over six miles deep. There have been several "holes" observed on the surface of Mars. Rather than "caves", they are generally thought to be lava tubes created by volcanic activity. Christened "skylights" by scientists, there is conjecture that they may lead to an underground cavern system which may have more benign conditions than the surface and thus may harbour some sort of life. They are also being considered as possible refuges for humans reaching the planet on future martian missions. To this end, something called the "Caves of Mars" project has been initiated, to search for more of these potentially useful features. As with all rock-based planets, Mars has a crust, mantle and core. The crust is between 31 and 78 miles thick, considerably more than Earth, despite its smaller size. This layer contains the elements silicon, oxygen, iron, magnesium, aluminium, potassium and calcium. Next, at around 1,500 miles thick, is the mantle, consisting of silicate compounds. The remaining 1,120 miles of the planet's radius is taken up by a partially fluid core, made up of iron sulphide and nickel. Mars has a very thin atmosphere. Around four billion years ago, the planet lost its magnetosphere, which is a fancy way of saying that it now has no magnetic field to speak of. A serious result of this was that the lethal solar wind could then freely buffet the planet, which resulted in most of the original atmosphere being blown away. This image shows the tenuous martian atmosphere. It consists mostly of carbon dioxide, with small amounts of nitrogen and argon, plus minute traces of oxygen and water. 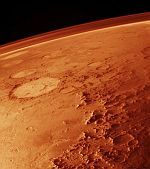 The planet also appears to produce methane, as small plumes of the compound have been detected by martian space probes. Is There Water on the Planet Mars? As stated above, minute traces of water can be found in the martian atmosphere, in the form of water vapour. There is also ice, in the shape of the two polar ice caps. The presence of liquid water, however, is not possible, due to the low atmospheric pressure and low temperature. 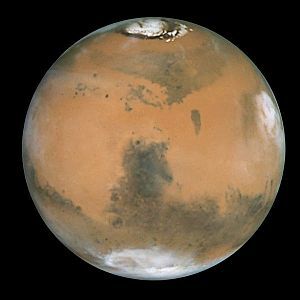 It is thought that, around four billion years ago, Mars was much warmer, allowing liquid water to flow freely and the planet experienced rain and snow and featured lakes, rivers and even oceans. This suggestion is still very contentious, however. Nevertheless, because of the presence of features that look like dried river beds and evidence of what appears to be water erosion, it seems a distinct possibility that liquid water once existed on the planet. When Mars was warmer billions of years ago and liquid water existed, could life have formed, evolving into an intelligent species? The simple answer is, we don't know. However, possibly fuelled by the "canals" theory, at the end of the 19th century, certain members of the scientific community were convinced that there was some sort of intelligent life on Mars, sending signals to Earth. In 1899, the inventor Nikola Tesla was monitoring atmospheric noise when he heard a signal which he described as possibly "due to intelligent control". A few years later, Lord Kelvin added his support to this, suggesting that intelligent martians were attempting to contact the USA. He later retracted his statement. Today, after numerous space probes both landing on and orbiting the planet, it is seen for what it is - a barren wasteland. There still remains the possibility of life on Mars, however. It is thought that alien micro-organisms such as microbes may exist on (or in) the planet. It has been postulated that they are responsible for the plumes of methane that have been detected in the atmosphere. What About the Famous Martian "Canals"? The word "canals" is a translation of the original Italian - "canali". This word was first used in relation to Mars by Italian astronomer Angelo Secchi, in 1858 and he used it to describe any large feature he observed on the planet. Back then, before the days when photography was used in astronomy, people viewing celestial objects had to draw what they observed. 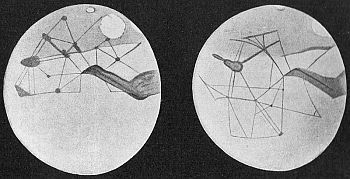 In 1877, another Italian astronomer, Giovanni Schiaparelli, drew a map of Mars, as he saw it, containing a network of straight lines, which he termed "canali". This idea was seized on at the turn of the 20th century by American Percival Lowell. 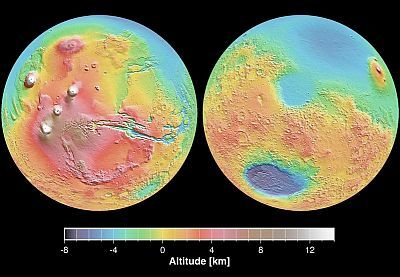 He drew his own map of Mars, containing what he termed "canals" and suggested that they were irrigation channels to tap the polar ice cap. Thus, it was evidence of an intelligent life form on the red planet. This led to "Mars fever" among the general public and resulted in many examples of popular fiction featuring intelligent martians, such as H. G. Wells's "War of the Worlds". 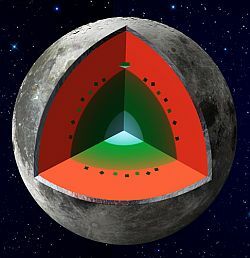 The scientific community, however, didn't hold much credence with Lowell's theory and they were proved right when probes sent to Mars showed no evidence of canals and suggested they must have been an optical illusion. The planet Mars has two small moons, Phobos and Deimos. They orbit the planet at quite a low altitude, Phobos much faster than Deimos. The result of this is that, from the surface of Mars, due to its own rotation, Phobos rises in the west, while Deimos rises in the east. They are really small. 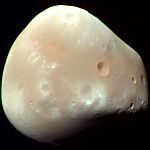 Phobos has a diameter of just under 14 miles, while Deimos is a mere eight miles. This tiny size results in their not possessing enough gravity to make them spherical and are, therefore, quite an irregular shape. Although the general theory for their origin is that they are captured asteroids, this has never been conclusively proved. Both objects are heavily cratered, but Deimos, overall, seems to have a much smoother surface than its sister moon. Phobos has an exceptionally low orbit. At an altitude of only 3,700 miles, it is gradually falling towards the planet. Eventually, it will either hit Mars, or be broken up to form a ring around the planet.